"Stop gawking like a simplton," Lord Perronet snapped, his hooked nose twitching with annoyance as he waited for his niece's horse to come beside his. "Are you trying to look like a fool?" Elizabeth tore her gaze from the castle ahead. The massive structure loomed out of the gray mist as if it were some sort of angry beast watching its prey come closer. "Given all the unexpected things that have happened to me in the past three days, would it be so surprising if my brains were addled?" Her uncle's eyes narrowed slightly as he surveyed her with obvious displeasure, as he had at intervals ever since he had come to the convent to take her away. "You're still the same," he muttered. "I was hoping the good sisters had tamed you by now." "They tried, Uncle, they tried." He grunted scornfully as he continued his dissatisfied scrutiny. Elizabeth knew she was not pleasing to look upon. If she were, she would not have been sent to the holy sisters thirteen years ago, into that horrible living death. She would have stayed with Lady Katherine DuMonde to finish her education in preparation for marriage and her duties as the chatelaine of a castle. She would have married. She would have had children. "You must make an effort to behave properly, as a highborn lady should," he commanded. "You wish I were more like my cousin Genevieve, no doubt." "That harlot? No, I certainly do not." Beautiful, ladylike Genevieve, her cousin, should have been making this journey to Donhallow Castle today. Instead, she had compromised her honor with a Welsh-Norman nobleman and married him, leaving her uncle with a terrible dilemma. He had already arranged a marriage alliance with the powerful Lord Kirkheathe and, rather than have it thwarted, had come to the Convent of the Blessed Sacrament to give Elizabeth the choice of remaining there until the day she died, or taking Genevieve's place as Lord Kirkheathe's bride. As she had thought then, so she thought now: she had never had a simpler decision to make. A chance for liberty of some sort, or slavery and deprivation for certain. "You have told me almost nothing of Lord Kirkheathe," Elizabeth prompted as they continued toward Donhallow. Now she could make out a village huddled at the base of its walls, like peasants around a warm fire - a much more pleasing conceit than the first sight of their destination had engendered. "What is there to know?" her uncle replied. "Kirkheathe is rich, respected, has friends at court and we should pray to heaven he takes you in Genevieve's stead." "What will happen if he doesn't?" Her uncle turned his hard black eyes toward her. "Let us just say it will be better if he does. A man needs all the friends at court he can get." "You do not trust the men at court who are supposed to be your friends?" "I said nothing of the kind." "Why else seek a family alliance with Lord Kirkheathe? His lands are far from yours." "Since when has a woman who has spent the past thirteen years in a convent understood anything of politics and alliances?" "You think there are no politics in a convent? No alliances to be made or broken? No secrets to be kept? No power to crave? By our Lady, Uncle, I am not the simpleton if you believe that." "This is nonsense. All that matters is that Lord Kirkheathe accept you, and then all will be well, for you and for me." "If I am to confine myself to womanly subjects, Uncle, tell me about the man himself." "What is there to know beyond what I have told you?" Her uncle made a scoffing laugh. "You are hardly in a position to care about the man's looks." "Since I am no beauty, it has occurred to me that if he is not a fine-looking man, he may care less about my features." "You'd look better without that wimple. Indeed, you resemble Genevieve more than I ever thought possible." "Has Genevieve been ill?" she asked, thinking that perhaps something had happened to ruin Genevieve's looks. As Elizabeth eyed him skeptically, she recalled every jeer and criticism the other inhabitants of the convent had aimed at her, the Reverend Mother's most of all. No, she was not pretty. Why even imply that she was? "He doesn't know, does he?" Her uncle started, making his horse whinny. "Who doesn't know what?" "Lord Kirkheathe doesn't know about Genevieve, does he?" Despite his denial, Elizabeth knew she had hit the mark. "When do you intend to tell him who I am - before or after the wedding?" Looking at the road ahead, her uncle didn't respond. "If he is an important man, you would not be wise to try to trick him. If he has friends at court, he will hear about Genevieve soon enough, and then it would go hard on you, Uncle," Elizabeth said. "Besides, I will not let you. I have no desire to be married under false pretenses." "Would you rather go back to the convent?" "No, I would not," she said, meaning it. Life there had been a hell on earth, of near starvation and punishment and toil and cold. "But I will not begin a new life based upon a lie. I have done nothing wrong, and neither have you. Surely he will see that you are trying to keep your bargain. Or was he particular about Genevieve? He cannot have met her, or you would not even think of trying to fool him." "All Lord Kirkheathe cares about is that his bride be a virgin." "Well, in that, I am superbly qualified. I hadn't even spoken to a man from the time I arrived at the convent until you came to get me. So, Uncle, I see no need to tell lies." "Of course I wasn't going to try to pass you off as your cousin." She didn't believe that for a moment. "Just so long as we understand one another, Uncle." "A Perronet woman is a Perronet woman." "But I am not Genevieve. I am older than she, for one thing." His words did not comfort her, for she still saw trepidation in his eyes. What if Lord Kirkheathe did not want her? What if he sent her away? "I would not speak to him as you do to me, Elizabeth," her uncle continued sternly. "I can assure you, a man of his rank and reputation will not stand for it." "I promise I shall be a very humble and dutiful bride, Uncle," she vowed, determined to do almost anything rather than return to the convent. "The Reverend Mother was very diligent in her efforts to make me humble and dutiful." "I do not think she succeeded very well." "She taught me how to look and act humble and dutiful when it is necessary," Elizabeth clarified. "I wish you would act that way with me." She gave her uncle a sincere smile. "I have been myself with you, Uncle. Isn't that better?" His harsh response stung her, but she had learned well how to maks her hurt feelings, too. "How old is Lord Kirkheathe?" "If he is not young, you might want to remember that I could be his widow one day, Uncle. A very rich widow, in charge of a great estate." Again she hit the target and when he looked at her, there was a hint of grudging respect. "He is, I think, eight and thirty - but you might have a son of age to inherit before he dies." "I hope we have many sons, and daughters, too. Has he other children?" "Has he been married before?" Her uncle's face reddened as he craned his head to look up at the gray sky. "Enough questions! I think it is going to rain. We had best make haste." He called an order to the leader of his men, and in the next instant, they were trotting toward the village, and the forbidding castle beyond. Absently scratching the large head of his hound, Raymond D'Estienne, Lord Kirkheathe, sat upon the chair on the dais in his great hall like a king upon his throne. Around him, a bevy of servants stood waiting, too, tense and expectant, glancing at their lord, each other, or the door to the kitchen. Not a one of them dared to speak, or else they would be looked at by Lord Kirkheathe. His notice was something they all wished to avoid. Outside, rain splashed against the thick walls of Donhallow Castle, heavy enough to be audible above the fire crackling in the hearth nearby. The wedding party was late. Perronet and his niece should have been here hours ago. Perhaps something had delayed them yet again. He had been receiving messengers from Perronet for days, all bearing excuses for tardiness. If the man and his niece didn't arrive today, it would be the end of it. He was not a beggar or a fish to be kept dangling on a line. To be sure, he needed the money promised for the girl's dowry, but he could find another bride now that he had finally decided the time had come to marry again. As for the personal attributes of the woman herself, they were far less important than the money she would bring. For the past several years, Raymond had been trying to maintain his castle on the income from his estate, but Donhallow was ancient and in need of more repairs than he could afford without additional income. Rather than let it fall down around him, he would marry. He also needed a marital alliance, lest his enemy garner more support than he at both the king's court, and that of their common overlord, the Earl of Chesney. A cry went up frm the wall walk and all the servants glanced nervously at their lord, who made no move at all. As they had kept him waiting, he would wait here for them. He would not go out in the rain to bid them welcome. The door to the hall banged open and Barden, the commander of the garrison, marched to a halt, water dripping from his cloak and helmet. "Lord Perronet and his party have come, my lord," he announced. Raymond inclined his head, and still did not move. Let them understand that he was angry. Barden, who had begun his career as a foot soldier here, knew better than to wait for more of a response. With the brisk miliary efficiency he had always possessed, he turned on his heel and departed. The door opened again a few moments later, and the familiar figure of Lord Perronet hurried into the hall. Behind him, likewise swathed in a dripping cloak, was a woman. The bride, no doubt. As Raymond watched without any alteration of his expression, Lord Perronet approached and bowed, one wary eye on Raymond's dog, Cadmus. "Forgive us the delay, my lord. The weather has been most unseasonable, as you are no doubt aware, and we had trouble with a lame horse. I cannot possibly say how pleased I am that we have arrived safe at last." He made a hopeful smile, which did absolutely nothing to appease Raymond; nevertheless, he finally rose and bowed in response. "Allow me to present my niece, my lord," Perronet said, turning and gesturing for the woman to come forward. She did, walking neither slowly nor quickly, and as she did, she raised her arms and pushed back the hood of her soaking gray wool cloak. Perronet had claimed his niece was a great beauty. Raymond had believed that to be a lie, or an exaggeration, something meant to increase the bride's value. Her slender face was surrounded by the severity of a wimple, but that only seemed to emphasize her lovely features. Large, brown eyes crowned with shapely brows shone in the torchlight. Her nose was perfect, mercifully different from her uncle's, and her cheeks looked as soft as velvet. Then there were her lips, rosy and full, the bottom slightly more than the top. Lips made for kissing. Pure, raw desire, a sensation last felt so long ago as to be nearly forgotten, hit Raymond, as strong as the blow of an enemy's fist. A need suddenly burned in his blood and sent it throbbing through his body, reminding him of the emptiness of his days. And nights. Even as these sensations sprang to life, Raymond told himself they were feelings he did not want. The yearning coursing through him was but a weakness - a weakness he had fallen prey to once, and never would again. The woman came to a halt beside her uncle. She glanced at Perronet, then turned her remarkably intelligent eyes onto him. "I am Elizabeth Perronet." Her voice was as unexpected as her face, musical and very pleasant - and very determined. Yet it was not the unexpected nature of her voice that made Raymond frown. "My lord," Lord Perronet began after giving the woman a swift and censorious look. "This is my other niece. Genevieve has unfortunately proved herself unworthy of your lordship and the honor of being your bride. Elizabeth, however, is equally suitable - and of course, the dowry remains the same." Whatever was going on, Raymond realized, they didn't need an audience. They could discuss it in the privacy of the solar. He gestured for Cadmus to stay, then looked pointedly at Lord Perronet before turning toward the tower that held his solar. The man spoke quietly to his niece. "Wait here. I shall settle this accordingly." "No, Uncle," she replied, making no effort to speak softly. "This concerns me, so I should be a party to the discussion. I am not a piece of furniture or a block of wood." Raymond turned back and raised an eyebrow. A bold woman. Was that good - or bad? Allicia had not been bold, not until the last night of her life. Raymond again started toward the solar and heard them follow. "Is he mute?" Elizabeth Perronet whispered as they climbed the tower stairs. Raymond's lips twisted into a smile as he waited for them at the door to his solar. He let her uncle pass into the room, then, when she was beside him, he answered. "No, not mute," he said in a harsh rasp, all that was left of his once fine voice. This book is part of Margaret's Warrior Series. As with all Margaret's books, however, this one is written with the understanding that not everyone will have read the previous books in the series, so a new reader shouldn't feel lost. 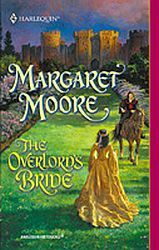 Cover Art Copyright © 2001 by Harlequin Enterprises Ltd.
From the book THE OVERLORD'S BRIDE by Margaret Moore. Harlequin Historicals, May, 2001. ISBN 0-373-29159-0, Copyright © 2001 by Margaret Wilkins Permission to reproduce text granted by Harlequin Books S.A. Cover art used by arrangement with Harlequin Enterprises Limited. All rights reserved. ® and TM are tradmarks of Harlequin Enterprises Limited and/or its affiliated companies, used under license.